A quarter century ago, Art Spiegelman and Françoise Mouly put out Raw— a highbrow mixture of underground cartoonists and French BDs where, in general, the id was fully on display. In Vol. 2 No. 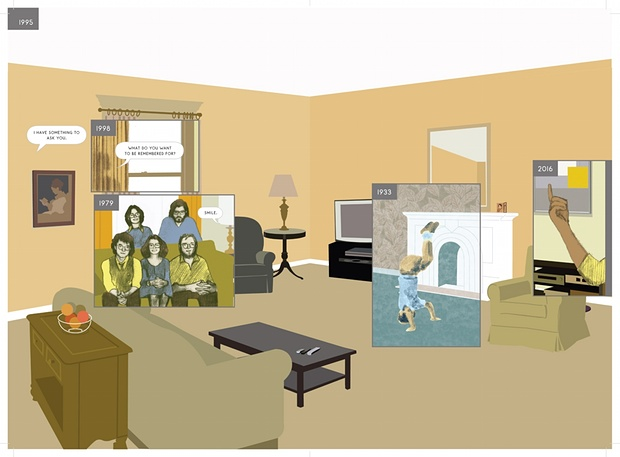 1 (1989) six pages were devoted to a little story called “Here”, by Richard McGuire, which looked a little too clean and cool for its surroundings. It was also the most mind-bending piece in the whole 200-page issue. Every image of “Here” depicted the same scene, from the same viewpoint. But that wasn’t the clever bit. The clever bit was that not all the panels showed that scene in the same year. In fact, after a few establishing panels, windows within each panel showed different years. The entire six pages depicted– out of order– a story ranging from 5 billion BC to the year 2033. 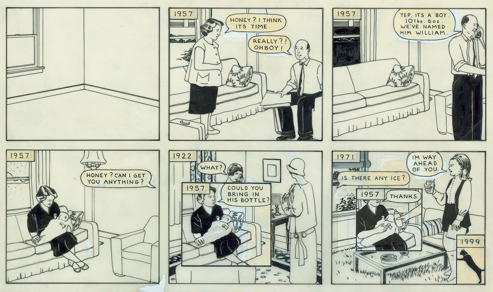 Most of the story was concentrated around a single lifetime, from birth (1957) to death (2027). It was a fascinating look at a place, a lifetime, at how moments could be connected not just in linear sequence but by theme: similar events occurring in the same place; a woman’s complaint about cleaning repeated over the years; a tree growing; echoes of action or dialog. Oh, here. Here’s “Here”. Just go read it. Six pages, light as a feather and dense like lead. It refrains from any sort of comment, and somehow seems to be about everything: time, space, life, humanity. It was just amazing that you could do this in comics. Now, McGuire has produced Here, a version of the same idea, but 300 pages long, and in color. Before you read the rest of this page, you should open a new tab, order the book, and read it. It expands the original idea, playing with the resonances of time and space, and the color version is spectacular. Plus the corner of the room is in the crease of the book, which is a neat iconic idea: the opened book echoes the shape of the room. Better yet, get the iPad version, where reportedly you can view the book in multiple ways, or trace a particular thread chronologically. OK, now that we’ve read it, I’m going to say: it’s neat and I like it, but the 300-page version doesn’t blow the mind at 50 times the rate of the 6-page story. A lot of what McGuire does here, he already did in the previous version. It’s a neat way to play with the medium, but it’s definitely in experimental mode, and in such things the emotional temperature tends to be low. There’s a set of family pictures that look a lot like real family photographs, and from articles on the book, it turns out they are real photographs from McGuire’s family. Likewise, a bit that seems like rather a stretch– a connection to Ben Franklin– turns out to be literal truth: McGuire’s childhood home in New Jersey was across the street from Ben Franklin’s son’s house. Similarly, a visit from the local archeological society (they want to dig up the back yard for Indian bones) really happened. The thing is, when you have to read news stories about the book to understand the connections, that’s probably a sign that the artistic method is a little too detached. The book plays delightfully with its concept, but it doesn’t cohere as a story. There are recurring characters but after two readings I couldn’t tell you who they all are. Oops, I should learn to write these things with the positive stuff at the end. The 6-pager did seem short– more like a proof of concept. The book takes it slow, runs the idea through all its variations, is more careful about history (it’s a nice touch that the Native Americans speak an actual Algonquian language), it’s full of quirky juxtapositions, and it’s gorgeous to flip through.